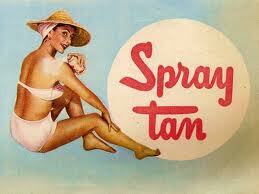 NOW OFFERING AIR BRUSH SPRAY TANNING! GET BEAUTIFUL ……GET BRONZED AND GET NOTICED! Moisturize and hydrate your skin with our all natural airbrush spray tan. In minutes your skin will be shimmering with a beautiful summer glow! Our exclusive airbrush spray tan solution consists of a perfect blend of natural ingredients keeping your skin radiant throughout the tanning process. Our fine blend will not make you “orange” but rather give you that sweet sun-kissed, healthy appearance. Ingredients include Organic Aloe Vera, Vitamins A,C and E, Chamomile Essential Oil and ingredients such as Cucumber and Green Tea Extracts. Tan normally last approximately 5-7 days depending on skin type. Enjoy summer glow all year round by having our trained Airbrush Technician spray tan you today! Sunless tanning products use a compound called dihydroxyacetone (DHA). This natural complex works with your skin’s own proteins to give your skin a 100 percent natural-looking tan color. The fine mist solution is gently sprayed by our trained technician. The DHA or sugar compound reacts with the outer layer of skin giving you a beautiful sun-kissed glow. Your tan can last between 5-7 days*. We provide the sunless airbrush treatment for people in whatever they are most comfortable wearing. You may choose to wear a black or dark bikini, underwear, and a cotton bra, or plain cotton underwear. If you wear garments during your session you will have tan lines and the garment should be washed the same day. Wear dark loose fitting clothes and sandals following each session, tight clothes may rub off tanning solution. Each skin type is unique and results will vary. Please note that Tan Without Sand requires parental consent of any Spray Tanner who is under the age of 18.